Head along to EFFM today! “Are tourists destroying the planet? This compelling documentary raises urgent questions about one of the most powerful globalising forces of our time: tourism. Spanning South America, Africa and Asia, the tourist pathway known as the ‘gringo trail’ has facilitated both life-altering adventures and serious damage to once-pristine environments. A drunken man lies beached on the sand, water laps at his feet, wayward pieces of trash stick to his oblivious face like a coat of barnacles. 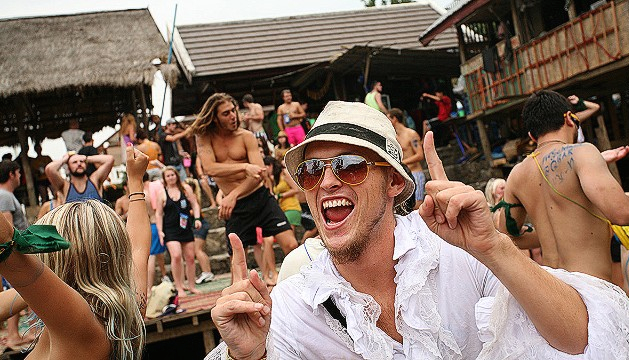 He is one of thousands of party-hungry tourists to descend upon Haad Rin Beach, Thailand, for New Years Eve celebrations. (Estimated at as many as 50,000 in 2010). Before 1979, not so much as a sticky tourist finger had been laid upon the beach. But, as National Geographic writer Costas Christ explains in Gringo Trails, this changed after he stumbled across the hidden paradise, word gradually seeped out (in a fashion that sounds remarkably similar to the plot-line of The Beach), and the backpackers swarmed. Made by seasoned traveller and anthropologist, Pegi Vail, the documentary examines the people who traipse along the ‘gringo trail’: a “crisscrossing highway”of discovery, experience, and quite often, cultural cringe. Luckily, the bucket-swilling party freaks are an extremity; not all tourists are just interested in getting messy in tropical surrounds. Some claim to want ‘authenticity’, to want to rough it and throw caution to the wind in the name of being ‘a free spirit’. But, the majority of them it seems (of us, if we’re being honest) will opt for a level of comfort, of safety, of—as travel writer Rolf Potts puts it in the film—“manifestations of home”. Vail has a clear appreciation for the anecdotal nature that travelling encourages. There are some brilliant stories punctuating the larger questions. We are introduced to the story of Yossi Ghinsberg, an Israeli traveller who got lost for a month in the Bolivian jungle in 1981. Teetering on the precipice of death, he was whisked to safety by locals just in time. Ghinsberg wrote a book about his jungle experience, more Israelis came, then everyone came, and the communities were irreparably altered. Technically, the doco gets the job done; it is visually straightforward, the filmmakers relying mainly on travel footage and archival photos, plus an occasional, slightly nauseating helicopter jungle shot, but this doesn’t hinder the storytelling. Examples of controlled tourism are briefly discussed. In Bhutan, guests must pay $250 a day and adopt local customs if they want to visit the country. But, this system raises questions of elitism. “We get a lot of millionaires and retired professors,”explains a local monk. The film ends on a moment of poignant optimism. Costas Christ suggests that “it’s not too late”for for the remaining Haad Rins of the world. Then, in keeping with the entertaining sensibility, a prologue offers a joke: Ghinsberg, back in Bolivia, hears his own story recounted back to him by an over-enthusiastic Bolivian tour guide. In a panel session following the screening, guests (researchers Sue Beeton and Ben Iaquinto, and Peter Dann of the Phillip Island Nature Park) continued the conversation. There seem to be no easy answers, but all agreed, the ethics of tourism are undeniably murky waters, and something almost all of us will be complicit in at some point in our lives. The Environmental Film Festival is running from the 4th – 12th of September. For more on the EFFM, clickhere. If you’re digging ReelGood, sign up to our mailing list for exclusive content, early reviews and chances to win big!